The Parisian group G's Way consists of Gérald "GG" Bonnegrace (percussions, trumpet, trombone, keys, bamboo flute), Thierry "JP Groov" Jean-Pierre (bass), Stefane Goldman (guitar ), Sylvain "Sly" Fetis (tenor and baritone saxophone) and Christian Templet (drums). This French project is created and leaded by Gérald "GG" Bonnegrace, composer and musician. He also composed and arranged all tracks of the debut album Seventy Seven (2012). This album is available on his website. Quiet unusual is also the fact, that the album can be listened in full length at this site. So the listener can really check out, what he gets. Gérald cites his influences with Ray Baretto, Eumir Deodato, Fela Kuti, Grover Washington Jr and many others, what is from the stylistic view very broad. There is a smell of acid jazz in the air, when the group starts with Latin Bubbles. Embedded in fusion music we are surprised with a short excursion into salsa. Gerald takes the lead on trumpet showcasing his talent with cool jazzy improvisations. The title track takes us far back in time to the 70's, when groups such as Fela Ransom Kuti dominated the scene with African Jazz Fusion. The song features Thomas Koenig on flute, a jazz graduate from Toulouse and Berklee and music professor in Bordeaux with some exclusive escapades. The percussive Catch Me If You Can casts a harsh light on the Latin music scene, as we await it for example in Cuba. But this music originates from Paris! The percussion and brass of Dirt Road immediately reminds me of Kuti's blaring horn sections. On the short intermezzo Faubourg Saint-Denis Thomas Koenig impresses again with his classy flute skills. Parisisco presents fusion jazz saxophonist Pierrick Pedron. who already got a name by performing with greats like Mulgrew Miller and Lewis Nash. At the interface to smooth jazz can be found How U Doin' pleasing with melodious vibraphone sound and polite horn arrangement. Some jazz improvement delivers Yan Schumacher on flugelhorn. Advantages in terms of speed gathers Escapade. Don't Be Quiet lives of his intimate conversation between the saxophone and guitar, but excels with GG's vintage keyboard niceties. The final Kiss and Fly leaves nothing to be desired in exotic score. Paris has always been shown as a fountain of many musical styles. 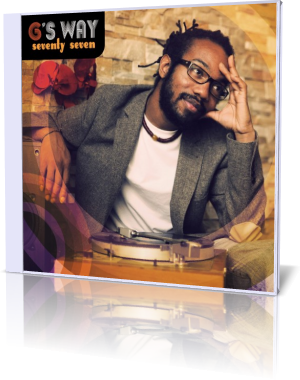 G's Way's Seventy Seven brings miraculous to light, jazz fusion you never heard since eons of years.